Wilson Kipsang broke away from Deriba Merga after 38km, with a devastating 2:48 kilometre, to win in a new course record 2:06:13 writes Ken Nakamura. It is the third fastest time on Japanese soil. His best is the 2:04:57 he recorded when he won in Frankfurt in October. About 40 runners passed 10km in 30:00 and 22 of them went through halfway in 63:30. Kipsang moved up to behind the pacemakers, but after 24km it was Merga who pushed the pace and reduced the lead pack to five, although the chasing group, 9-strong, caught them at 25km (1:15:06). Soon Merga tried again and only Kipsang stayed with him. Kipsang took the lead after 30km (1:29:51) but Merga surged again at 31km. The duel continued through 35km in 1:44:50 with the pair now a minute ahead, but when Kipsang kicked at 38km Merga had no power to resist. Behind them Hiroyuki Horibata won the battle to be first Japanese and in doing so climbed past Moses Kangogo into third place. Kipsang's winning time moved the Lake Biwa Marathon course record up from 23rd best to 12th best in the world. Levy Matebo Omari, only 21, won with the 4th best time of the year so far, and only one second outside the course record established last year. Behind him 12564 runners finished the race (of 13062 starters and 15075 entrants). Foreign participation was 45%, with runners from 40 different countries. Tens of thousands of people watched the passage of runners through the streets and 40 points of animation were dotted around an attractive course that started and finished in the avenue María Cristina, in front of the Montjuïc fountains, after passing by the main tourist sites of Barcelona. Omari improved his personal record by more than four minutes. The Catalan Marc Roig was first Spanish national, in ninth. Visa problems prevented the participation of a group of Ethiopian runners, but the race was fast from the beginning thanks to pacemakers, Nicholas Korir, Edwin Kipyego, Mark Tanui and Gamal Belal Salem. They took a group of 11 runners through 10km in 29:59 and halfway in 1:03:59, with Kipyego leading the way. At 30km there were still 8 runners together but after the pacing stopped at 31km Omari was left leading, passing through 35km in 1:45:59 and 40km in 2:00:55. Towards the end he paid for his solo efforts and lost the 5000 euro course record bonus by a couple of seconds. Roig, who had been training in Kenya was pleased with his new personal best and his final ninth position as the first Spaniard. Toni Bernadó from the tiny state of Andorra was seventh and met the London 2012 qualifying standard to set himself up for his fifth Olympics. In the women's race the surprise winner was Josephine Ambjörnsson, a popular Swedish athlete who won her first marathon ahead of debutante Nuria Prieto from Madrid. The race suffered from the last minute absence of three Ethiopians who were expected to challenge the course record of 2:30:05. 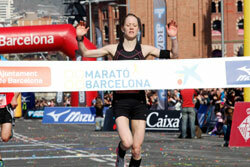 Ambjornsson said: "I ran the Marató de Barcelona for the first time last year and this year I came back and won. I can't still believe it, this is fantastic, I love this city". Kenya's Hillary Kimaiyo gave the this region of North-Central Mexico cause for major celebrations at La Fiesta Lagunera, writes Alan Brookes. He smashed the course record by almost a kilometre and beat his own Mexican all-comers mark of 2:09:54 run in Monterrey in 2008. And Torreon, where the Lala race is held, is at 1000m altitude. It's cowboy country, where John Wayne filmed many movies and owned a desert ranch. Torreon and surrounding municipalities is the base for the race sponsor, the Lala dairy conglomerate. Staring at daybreak from the dairy factory gates the race passes through the desert landscape but returns to finish in Terreon in the lush Bosque Venustiano Carranza, an oasis of greenery that exists only through irrigation. The Lala company gifts the Marathon to the town and its employees — 2000 of them together stage the race, assisted only by a single outside technical advisor, Ruben Romero. The 23rd edition took the event to a truly international level, especially as the entire area boasts a population of only 1.3 million. The race is chilly to start, but in the second hour the sun blazes down from cloudless skies. 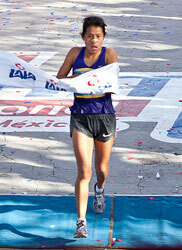 Runners from every state in Mexico and a number of foreign countries took off from the start. Kimaiyo was immediately in front along with five hostages, Mexico's Juan Luis Barrios, making his marathon debut, and four fellow Kenyans. At under three minutes per kilometre pace Kimaiyo had only two others with him at 3km, and only Barrios after 6km. They hit 10km in 29:51, with great crowds out in the cool morning air, and even the church bells ringing for the marathoners. At 15km [44:52] Barrios surged, and worked hard to open up a meagre 10m gap by halfway (63:09). At 25km (1:14:54) Barrios was 40m up but his pace slipped to 3:10 for the 28th kilometre and by 29km Kimaiyo was back in the lead. He hit 30km in 1:30:13 and the duel in the desert was all but over. Kimaiyo was left to battle the clock as Barrios hung on bravely for third, within the Mexican qualifying standard for London 2012. The women's race was not quite as dramatic, but gave the enthusiastic, record crowds something more to cheer about as Guanajuato's Paula Apolonio prevailed over Kenyan Neriah Asiba. But Maraton Lala is more about community and Lagunera pride than elite performance. This year's 4,000 participants equalled the race's previous best, 18.5% of them women. Crowds were strong everywhere, but particularly in Lerdo and at the record 41 community-charity animation sites that featured bands, dancers, costumes, and great energy. Packed grandstands at the finish are entertained with Latin music, stilt-walkers, noise-makers, confetti, and an outstanding mime artist. Ven y vive, La Fiesta Lagunera. On a morning that was sunny and probably too warm for optimum performance Zersenay Tadese forged ahead of the field after one-third of the race to record the second fastest time ever run, second only to his own world record performance in this race last year. Tadese paid little heed to his competition, setting his own pace and sticking to it. There was slight wind that was favourable for the later stages of the race but against for the final 2km. From being one second inside record pace at 15km he slipped to three seconds outside it by 20km and seven seconds outside at the finish line. By that time he had forged a winning margin of two minutes, and in such solitude and heat for so long this performance could well be ranked above his world record setting run last year. John Mwangangi chased Tadese as he broke, and ran in clear second for most of the race, although he was being closed down by pursuers towards the end. The women's race was much closer, although Aberu Kebede dictated the pace from the start, and held a marginal lead from the start until reaching the turn point in the centre of Lisbon. Shortly after that Paulin Ndjeri took over with several others now alongside Kebede. Grace Momanyi had started far less quickly, and worked her way through the field into third, passing a fading Ndjeri in the final stages. The revelation of the race though, was Dulce Felix, of the local organising club, who pushed through strongly at the end and was closing on Kebede in the finishing straight in an unexpected late challenge. 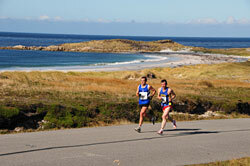 The elite race merged with the mass event, in which 8000 participated, after 5km. The mass race, and the 8km fun run in which there were 28000 entered, both start by crossing the Tagus River from the south side on the towering 25 de Abril Bridge. To ensure record eligibility the elite course lies entirely on the north side of the river. 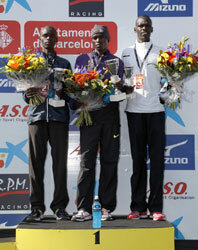 Dickson Chumba and Firehiwot Dado won the 17th edition of the Acea Rome Marathon, Dado for a third consecutive time. She followed the example of last year's men's winner Siraj Gena by running the final 200 metres barefooted to commemorate Abebe Bikila's Olympic victory in Rome 1960. She still crossed the finish-line in an impressive personal best time of 2:24:13, more than two minutes ahead of her compatriot Goitetom Haftu Tesema. The men set off from the famous Fori Imperiali and were led through halfway by pacemakers in 1:04:10 but a strong headwind slowed the pace in the second half. Pacing finished at 30km (1:31:58) and three men remained in contention, but Chumba broke away at 32km to run an impressive 30:11 for the final 10km. 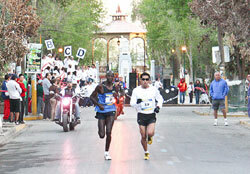 Gena overtook Abdullah Shami in the 40th kilometre to take second place. The women's race was an all-Ethiopian affair. Eight runners led by Dado dominated for most of the race although Rosaria Console ran a good rearguard action despite injury problems. The lead group passed halfway in 1:13:24, with Console running her own race two minutes behind. After 30km Dado had only Haftu Tesema for company after and at 33km she went ahead alone, running a significantly faster second half (1:10:49). Ethiopians took five of the first six places. 14,000 runners started the race, while about 85,000 runners took the streets in the 4km Fun Run. Last year's winners came nowhere near defending their titles as Abderrahim Goumri and Robe Guta took the honours writes Mirko Javala. After 10km was reached in 30:04 last year's winner Sylvester Teimet dropped off the pace. Although the pace then slowed a lot more athletes fell back and by 25km (1:15:56) there were only seven together, including home runner Jeong Jin Hyeong. Just 20 years old, Jyeong took the lead at 35km, ahead of Goumri, while all the others fell back. The experienced Goumri led by 13 seconds at 40km with Jeong in clear second. Behind them the Russian Oleg Kulkov moved through into third, equalling his personal best. Goumri easily held his ground to win his first Marathon in Korea. Jeong recorded his first sub-2:10 in only his fifth career Marathon. The women's pace was not as steady as the men's. A second 5km split a minute faster than the first one disposed of all but five runners: four Ethiopians and Chinese favourite Wei Yanan. Last year's winner Amane Gobena dropped back in the next 5km, along with Zehara Kedir, leaving the lead trio to go through 20km in 1:08:34. Mengistu fell back after 30km but Guta only finally decided the race in the last 2km, sprinting away to her second win in the race. Two time winner Wei Yanan now took her second runner-up finish, while Gladys Tejeda set a 2:32:32 national record for Peru in fourth. Imana Merga was a journeyman track runner, with two wins out of 10 races last year, but he had little trouble disposing of his three Kenyan rivals in the last 200m writes Phil Minshull. After two relaxed laps — the first was 14 seconds slower than the junior men — the race started in earnest on the third of the six laps, with 14 men still together. Matthew Kisorio and Paul Tanui increased the tempo but at halfway the group still contained 11 men, including the entire Kenyan squad, two Ethiopians, two Ugandans and Bahrain's Ali Hasan Mahboob. So it remained for another lap but then Mesfin Hunegnaw and Merga exchanged words at the start of the fifth lap and turned up the pace. That's where we decided to push hard. We both felt strong, confirmed Merga after the race. It had an immediate effect, stringing the leaders out, but Hunegnaw soon paid the price for his effort at the front and started to struggle. [That] was the moment when I chose to push the pace again. I was confident at that point that I could win the gold medal, said Merga. Kisorio, Tanui, Kenyan trials winner Geoffrey Mutai and their compatriot Vincent Chepkok all went past the flagging Hunegnaw, who drifted back to eighth place, and chased after Merga before running alongside him for most of the final lap. Mutai, one of the world's top marathon men who has been a revelation in cross country races on home soil this winter lost contact 500m from the line but his three compatriots only conceded defeat in the final few metres as they found they had no answer to Merga's finish. With a 5000m best of 12:53.58 Merga became the third Ethiopian winner in four years after the last of Kenenisa Bekele's six triumphs in 2008 and Gebre Gebremariam's win in 2009. I used to think of myself as a track runner but this winter I have got to like cross country races more, said Merga. In his only previous World Cross appearance, he finished seventh in the Junior race in Mombasa. With the next four men in Kenya easily took the team gold medal, and have now won for the last six years and 24 out of the last 26 years. Ethiopia's scoring quartet all finished in the top 17 for them to regain the silver medal slot after being usurped by Eritrea last year. It was a battle between two World champions for a World Championship neither had won, writes Len Johnson. Vivian Cheruiyot, 5000m world champion, had won the Junior World Cross title in 2000, but had never placed higher than eighth in the senior race. Linet Masai, 10000m world champion, won the Junior title in 2007, but in the senior event she had been pipped by team-mates in the final sprint for the last two years. Cheruiyot won, breaking away from Masai mid-way through the final lap after her team-mate had split the field up on the penultimate circuit. Masai was second for the third year in a row. 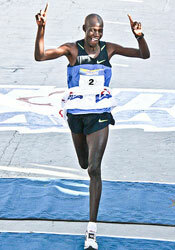 Kenya again beat arch-rivals Ethiopia to the team title. One of those dropped when first Masai and then Cheruiyot broke up the leading pack was Shalane Flanagan. But the American came charging back, moving past Meselech Melkamu of Ethiopia into third in the last kilometre. Flanagan, the 29-year-old Beijing Olympic 10,000m bronze medalist, is the first non-African born medallist since Benita Johnson won the long race in 2004 and the first American medallist since Deena Drossin took the second of her two successive silver medals in 2003. Flanagan explained that her improvement from 12th to third was due to marathon training which had elevated my game. Flanagan's team-mates packed well in 17th, 18th and 19th places to ensure America's second successive team bronze medal. Masai and Cheruiyot have battled back and forth all year, with their personal score now at 2-2. I feel very happy said Cheruiyot, I had been eighth three times. My goal was to win, because I came here very strong, said Masai. But I got second once again. Again she made the race; again she did not win it. Geoffrey Kipsang Kamworor finished only fourth at his own national trials last month, but won with a stunning display of gun-to-tape front running writes Phil Minshull. Kipsang's victory was rated by the cognoscenti as the most impressive since Kenenisa Bekele won a decade ago in 2001. He sped away from the gun with his arms pumping like a 400m runner and went through the first 2km at the head of a 14-man group in 5:22. The expectation was that he was making the pace, possibly for trials winner Isiah Kiplangat Koech, but it was soon clear that Kipsang had other ideas. I knew I was in great shape and decided to just run as hard as I could from the front. I knew there was a danger I might run out of energy but I felt I had a good chance. Unlike at many previous Championships Kenyan coaches issued no team tactics. After the brutally fast start, the pace eased slightly but it was enough to run the legs off some of the men chasing him and the pack was reduced to nine at the halfway point. Kipsang then put in another burst which spread out his rivals. Ethiopia's Bonsa Dida tried to hang on but later paid for his efforts while Uganda's Thomas Ayeko slipped back a few paces. Kipsang found yet another gear about 1000m from home to shake off all challengers and continued to wind up the pace to make sure there were no surprises in the finishing straight. Behind Kipsang, both Ayeko and Patrick Mutunga went past the flagging Dida in the final kilometre to take the silver and bronze medals respectively. The Kenyan team were far from their perfect 10 score from last year but still managed to take their 13th successive title in the category ahead of Ethiopia, as they have been for 11 of the 12 previous years. Ayeko's second place helped Uganda to the team bronze medals for the second successive year. A year ago, the barefoot Faith Kipyegon lost the individual bronze medal to team-mate Purity Rionoripo in the final sprint to the line writes Len Johnson. This time, she again went barefoot on the fast, well-grassed Punta Umbria circuit, but she made sure there was a long, sustained final sprint, not a short, explosive one. At the line, Kipyegon was a full second clear of Ethiopian pair Genet Yalew and Azemra Gebru. With Wagnesh Mekasha taking fourth and Emebet Anteneh eighth, Ethiopia regained the team title from Kenya, 17 points to 19. Kipyegon had been aware of the team situation as she made her winning surge. With half a lap to go, I realised my team-mates had drifted back, she said. I realised I was Kenya's only hope for a gold medal and I concentrated on my sprint. Kenyan trials winner Janeth Kisa was the final runner to drop off the lead group, finishing in an isolated fifth. Nancy Chepkwemoi and Rionoripo followed her home, but the team result was already sewn up. Japan took a highly emotional team bronze medal. A minute's silence was observed before the race to honour the victims of the devastating earthquake and consequent tsunami which struck the northern part of Japan recently. Led by Katuski Suga in 12th place — the first non-east African to finish — and Tomoka Kimura in 13th, Japan overtook Eritrea in the team standings during the second half of the race. Lilian Koech defended her title and improved the course record by almost five minutes. Former course record holder Judit Folding-Nagy came in fourth. The best Slovak Ingrid Petnuchova was in sixth. There were also new course records in the half marathon. Last year's winner Hosea Tuei defended his title just a few seconds ahead of Joel Maina Mwangi, both of them under Elisha Sawe's 2007 mark. Former tennis world number 12 Dominik Hrbaty, who was one of the event ambassadors, completed his first half-marathon in 1:27:54 (114th overall). Lucy Wambui Murigi was also the fastest ever in Bratislava with a personal best. It was only the men's marathon where the record remained intact. 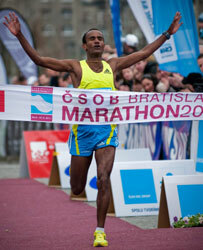 Erkolo Ashkenafi, a 26 year old Ethiopian living in Hungary, won ahead of last year winner Kenyan Edwin Kibowen. 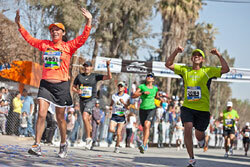 Total participation was up to 6513 runners from more than 30 countries, of whom 5723 finished their race. 6  Ingrid PETNUCHOVA              SVK  2:56:56.